Webinars, smart phones, an Internet-enabled library on wheels – public libraries are using a variety of cutting edge ICT to improve flows of vital information to farmers, to connect farmers to support agencies and to each other, and to enable farmers to apply for government grants online. EIFL (Electronic Information for Libraries) announced the launch of five new public library services for farmers. The new services are among 14 new public library services supported by EIFL’s Public Library Innovation Programme (PLIP). EIFL-PLIP provides small grants to public libraries in developing and transition countries to use ICT in innovative ways to contribute to national and local community development goals, in the areas of agriculture, health, children and youth at risk and employment. The five new agricultural services, designed and implemented by public libraries in Europe and Latin America, demonstrate the diverse ways in which public libraries can use ICT to improve farmers’ lives and livelihoods. They are part of EIFL-PLIP’s replication phase, which encourages public libraries to replicate innovative and successful public library services created during EIFL-PLIP’s first phase. Berd Public Library (Armenia) is working with agricultural service providers and civil society organizations to improve flows of practical and up-do-date information to farmers living in the Berd region, so that farmers can increase their yields and income. Berd Public Library will equip a computer laboratory for farmers in the library, and also take laptop computers to farming communities to conduct ICT training in their home villages. The library will create a website for farmers to find and share agricultural information and market their produce. Agricultural service providers will provide content on modern farming methods for the new service and for the website. Read more about Berd Public Library’s new Harnessing ICT for Improved Farming Practices service. Klintaine Public Library (Latvia) connects farmers across Latvia to sources of agricultural expertise and information through webinars hosted by a network of rural libraries. Through the webinars, farmers will be able to obtain information about modern farming methods and interact with government officials. Read more about Klintaine Public Library’s innovative Hand in Hand: Enhancing E-inclusion of Farmers at Rural Public Libraries service. Pasvalys Marius Katiliskis Public Library (Lithuania). Many farmers in Lithuania have smart phones, but are not using them to their full potential. This new public library service will train farmers to make the most of their smart phones, build a network of farmers using smart phones, and create a web portal where farmers can receive and share information anywhere and at anytime. The new web portal will include online produce market where farmers can advertise and sell their produce. In addition, the library will provide a desktop publishing centre for farmers to design and print leaflets, business cards and advertising for their produce. Read more about Pasvalys Marius Katiliskis Public Library’s new smart phone network for farmers. Public Library Laboratorio del Espiritu (Colombia) will increase flows of valuable information to fruit, vegetable and livestock farmers in six villages around del Retiro in Colombia’s Antioquia district, using the Internet, community radio, local television and mobile phone text messages (SMS). The new service will also strengthen existing partnerships and build new ones between farmers and farm support agencies. Read more about the new ICT for Rural Development service. 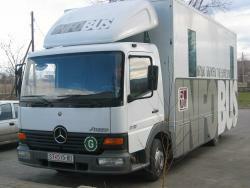 Regional public and university library Goce Delchev-Stip (Macedonia) takes ICT to farmers in an Internet-enabled INFOBUS. Trainers travel with the bus, and train farmers to use ICT to access information, especially information about grants and subsidies from the Macedonian government and European Union. ‘Application processes for funding are complicated for farmers, and they need help,’ explained Ms Vilma Jovanova, librarian and coordinator of Library on Wheels. ‘We will also share information about these activities on a web-portal linked to the library website. Most farmers do not have Internet access in their homes, so the solution is for us to take the Internet to the villages,’ she said. Read more about the Library on Wheels. After a year (2011-2012), these five public libraries will assess the impact of their new services, generating valuable new insights into how public libraries can work with farmers, the effectiveness of ICT, and the value of ICT to farmers’ lives. By encouraging replication, EIFL-PLIP aims to test how ideas travel, and how similar innovative community development services can be delivered in different geographical and cultural environments. The two services being replicated were implemented with EIFL-PLIP support in 2010-2011: Panguipulli Public Library’s ‘Communicating Farmers’ service (Chile), and Public Library Radislav Nikčević’s AgroLib-Ja service in Jagodina, Serbia. Both of these successful services are continuing to serve farmers.